Today, sadly, was the farewell lunch of my dear colleague and friend, Chryssa Skodra. Even the sky clouded and there was a sudden angry burst of wind when it was time for her to say good bye to Porvoo Campus, as if the ancient weather gods had interfered in this sad moment. I had prepared a Renaissance dance in honor of this Renaissance princess, because a Renaissance woman she is, in the true meaning of the word. Yet, at the end there was no time for any dancing, to my great regret, since dancing heals more than words and is of great comfort in those moments when words become futile. I have a vivid first recollection of Chryssa from November 2009 on Haaga-Helia Pasila Campus. In the corner of my eye I saw a very young woman in the act of interviewing the Ambassador of India, His Excellency Om Prakash. I immediately became curious about this young woman who looked almost like a high school girl. Who was this person who seemed so confident and competent despite her young looks? Later it turned out that she was Chrysoula Skodra, Greek journalist and Master of Culture Management from the prestigious Sibelius Academy. It still was hard for me to match the youth and all accomplishments. Later, when I got to know her better, I got to see what a phenomenal networker she was, as expressed by our colleague Evariste in his speech to Chryssa, an extarordinary woman from the future! I have been lucky to have Chryssa as colleague and friend for almost five years. With my own background in classical ballet and the rigid Vaganova system and with her roots in artistic gymnastics, we share the same childhood experiences of tough training and character building. I have never liked the phrase “it does not matter whether you fail.” Of course it matters if I take the wrong turn in the Waltz in ACT 1 of Giselle. It spoils the entire choreography! In this respect Chryssa and I share the same attitude: “We are not here to fail. You can do much better”, you might hear her tell students. 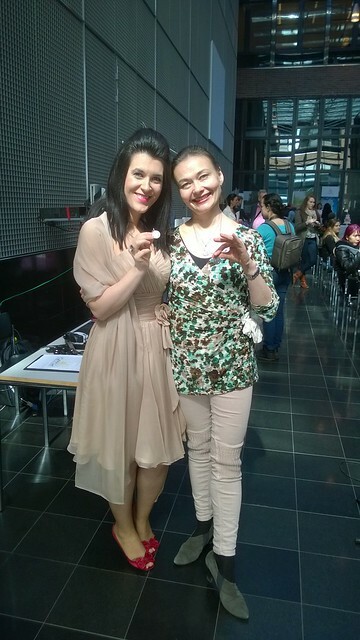 This became evident in the We Do Weddings in Every Sense fair organized this May on Pasila Campus. Chryssa demanded perfection and the students excelled! Yes, I would claim that they even exceeded their abilities under the inspiring and sparkling supervision of Chryssa, and we could all enjoy a fantastic event! Finally, anybody who knows me, is aware of the fact that I prefer non-verbal communication to words. This spring Chryssa and I prepared together a contact improvisation duet in an Anna Akhmatova inspired performance, Echoing Rooms performed at Encounters15 Conference on Porvoo Campus. Usually, it would take years to build up enough trust to do improvisation involving advanced weight shifts. In our case we had only one ordinary rehearsal and one dress rehearsal before going on stage. As it happened, during the performance I lost my balance and was already falling, when Chryssa pulled me back on my feet in a fraction of a second. This moment told more than a thousand words: about her alertness, intelligence and sensitivity. Chryssa would not let a friend fall, not literally nor metaphorically. She pulls people up and encourage them to do their best. Chryssa, now, when you are moving on to new challenges, I wish that you, in turn, will meet people who will pull you up in difficult moments, who will push you forward to unimagined heights and who would show appreciation for your Renaissance multi-talent, so rarely seen nowadays. Than you for all the lovely and inspiring moments together. Let’s keep in touch! This entry was posted in Uncategorized and tagged Chryssa Skodra, We Do Weddings in Every Sense. Bookmark the permalink. What a beautiful farewell post!